Google map shows results of the SOD blitzes available online at sodblitz.organd SODMAP.org. Green icons identify trees sampled that tested negative for SOD. 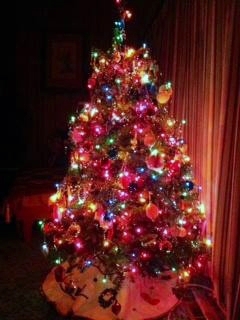 Red icons were SOD-infected trees. Sudden oak death, which has killed millions of trees in California over the past 20 years, is spreading more slowly, according to California's most recent citizen-science sudden oak death survey. The 2018 SOD Blitz results indicate Phytophthora ramorum (the pathogen known to cause SOD) infection is currently less prevalent in many wildland urban interface areas, though significant outbreaks are still occurring in some locations. 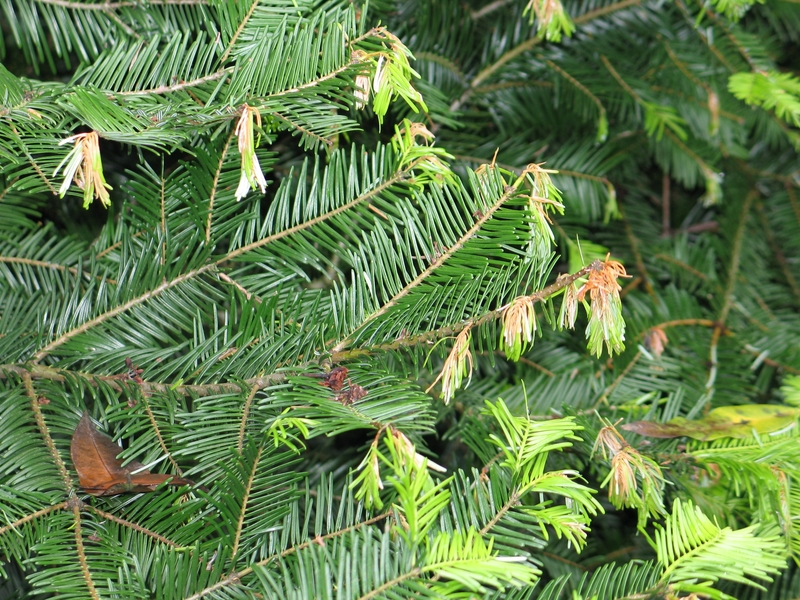 Overall, 3.5 percent of the trees (based on those areas sampled during the blitzes) were found to be P. ramorum positive, a threefold drop from 2017. Yet, in San Mateo, Santa Clara and Santa Cruz counties, infection levels were estimated to be as high as 19 percent, followed by 12.7 percent in the East Bay. 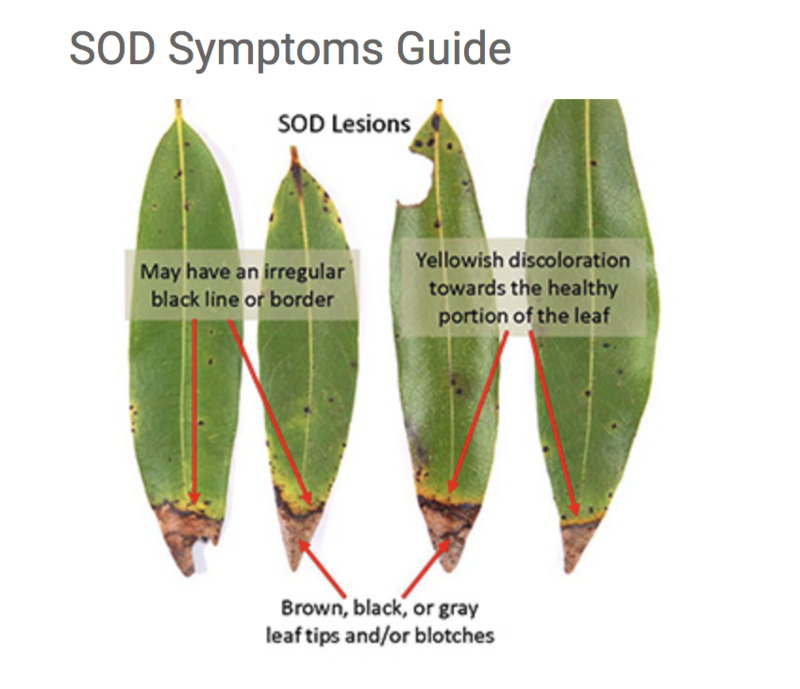 "SOD blitzes detected the highest levels of foliar infections by SOD in 2017,” said SOD Blitz founder Matteo Garbelotto, UC Berkeley forest pathology and mycology Cooperative Extension specialist and adjunct professor. “As predicted, those high levels of foliar infections were responsible for a high increase of infection of oaks and tanoaks by SOD. "Oaks and tanoaks were infected last year and will be showing symptoms such as bleeding in the stem and canopy drying this year and in the next two years to follow. Hence, despite a reduction of SOD infection on leaves of California bay laurels and leaves of tanoaks in 2018, we can expect a sharp increase in oak and tanoak mortality in 2018, 2019 and 2020." Notable outbreaks were detected in Alameda (El Cerrito and Oakland urban parks, San Leandro, Orinda, Moraga), Marin (Novato, Day Island, Woodacre, Sleepy Hollow, McNears Beach, China Camp State Park, north San Rafael, Tiburon Peninsula, east and west peak of Mt. Tamalpais, Marin City), Mendocino (south of Yorkville), Monterey (Carmel Valley Village, Salmon Creek Trail in southern Big Sur), Napa (east Napa city), San Mateo (Burlingame Hills, west of Emerald Hills and south of Edgewood Rd, Woodside ), Santa Clara (Los Altos Hills, Saratoga, Los Gatos, along Santa Cruz Co border), Santa Cruz (along the Santa Clara Co border, Boulder Creek), and Sonoma (near Cloverdale, east and west of Healdsburg, west of Windsor, east of Santa Rosa, west of Petaluma) counties. 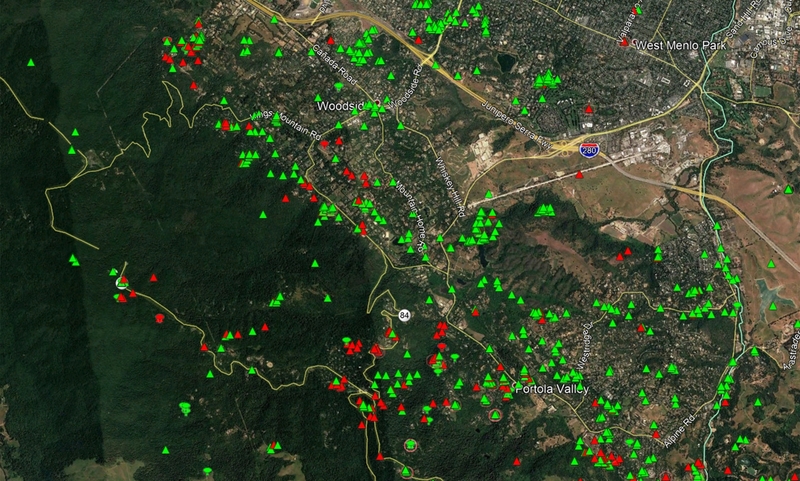 Several popular destinations where P. ramorum was found positive during the 2017 Blitz were negative for the pathogen in 2018, including Golden Gate Park and the Presidio of San Francisco, the UC Berkeley campus, and Mount Diablo State Park. Samples from San Luis Obispo and Siskiyou counties were also pathogen-free as were those from the southern portion of Alameda County. 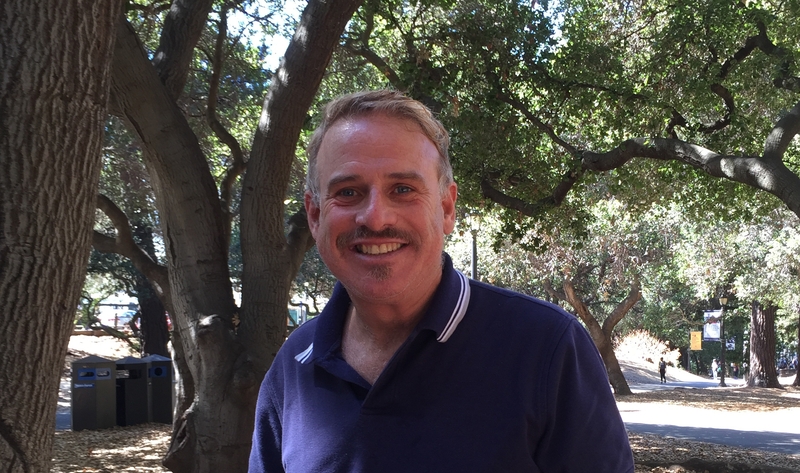 "We encourage everyone in affected counties to look at the Blitz results online and to attend one of the fall workshops to learn how to protect their oaks from SOD,” Matteo Garbelotto. “It is encouraging that SOD has yet to be found in the forests of California's northern-most counties, San Luis Obispo County and southern Alameda County,” said Garbelotto. SOD Blitz Workshops are being held this fall in Santa Rosa (Oct. 10), Portola Valley (Oct. 16) and Berkeley (Oct. 17). The trainings will discuss Blitz results and recommendations for protecting oaks in the WUI. Workshops are intended for the general public, tree care professionals and land managers (see www.sodblitz.org for details). Two International Society of Arboriculture continuing education units will be offered at each training. Data collected from the Blitz (both positive and negative samples) have been uploaded to the SOD Blitz map (www.sodblitz.org ) as well as to SODmap (www.SODmap.org) and to the free SODmap mobile app, which can serve as an informative management tool for people in impacted communities. SOD Blitz volunteers collect leaf samples and record the location using the SODmap mobile app. Twenty-five SOD Blitz surveys were held in 2018 in the WUI of 14 coastal California counties from the Oregon border to San Luis Obispo County and included three tribal land surveys. The 304 volunteers surveyed approximately 13,500 trees and submitted leaf samples from over 2,000 symptomatic trees to the Garbelotto lab for pathogen testing. SOD Blitzes are a citizen science program, which train participants each spring to identify symptomatic tanoak and California bay laurel trees in the WUI and to properly collect samples in the interest of generating an informative map of P. ramorum disease symptoms over time. Samples are tested for the presence of the pathogen at UC Berkeley and results are posted electronically each fall. Now in its eleventh year, the SOD Blitz program is one of the first in the world to join researchers and volunteers in a survey for a tree disease. SOD Blitz surveys were made possible thanks to funding from the US Forest Service State and Private Forestry, Midpeninsula Regional Open Space District, and the PG&E Foundation. The Blitzes were organized by the UC Berkeley Garbelotto lab in collaboration with the National Park Service, Presidio Trust, San Francisco Public Utilities Commission, Midpeninsula Regional Open Space District, Save Mount Diablo, Land Trust of Santa Cruz County, East Bay Regional Park District, Santa Lucia Conservancy, Sonoma State University, UC Santa Cruz Arboretum, Los Padres National Forest, City and County of San Francisco Department of Recreation and Parks, UC Berkeley Botanical Garden, and California Native Plant Society. For information on the status of P. ramorum/SOD tree mortality in California wildlands, see the US Forest Service 2018 Aerial Detection Survey results at https://www.fs.usda.gov/detail/r5/forest-grasslandhealth/?cid=fseprd592767. For more information on the SOD Blitzes, visit www.sodblitz.org or contact Katie Harrell at (510) 847-5482 or kmharrell@ucdavis.edu. For more information on Sudden Oak Death and P. ramorum, visit the California Oak Mortality Task Force website at www.suddenoakdeath.org or contact Harrell. 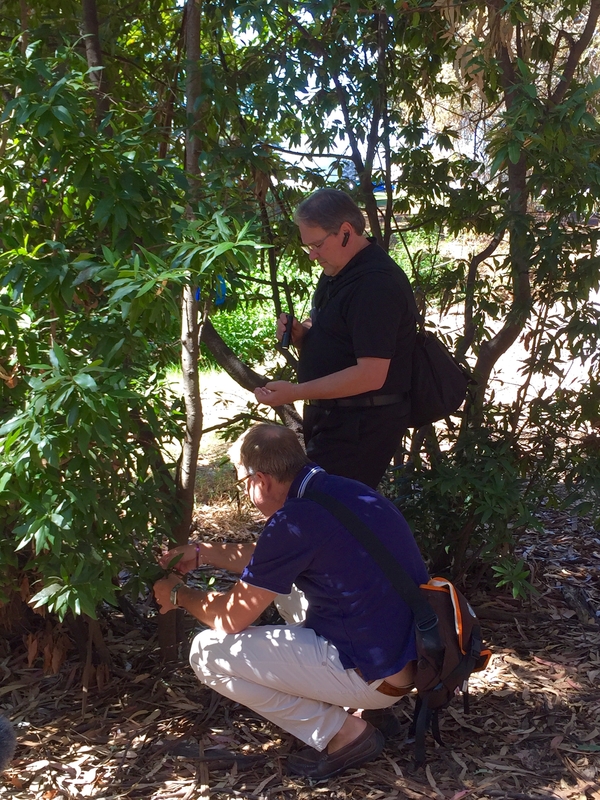 Doug Schmidt, standing, and Matteo Garbelotto examine a bay laurel on the UC Berkeley campus. 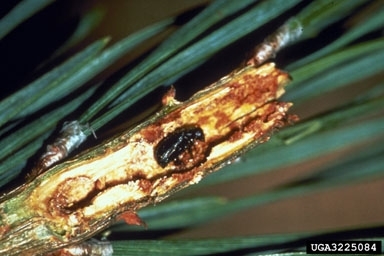 Results of the 2015 Sudden Oak Death Blitz survey reveal coastal mountain infestations in areas such as Big Sur (19% infection), the Santa Cruz Mountains (13% infection), and western Sonoma County (12% infection) remain high despite an overall decline in infection rates from 4.4% to 3.7% across California's 15 infested counties. Several new SOD outbreaks of note were identified during the blitzes. 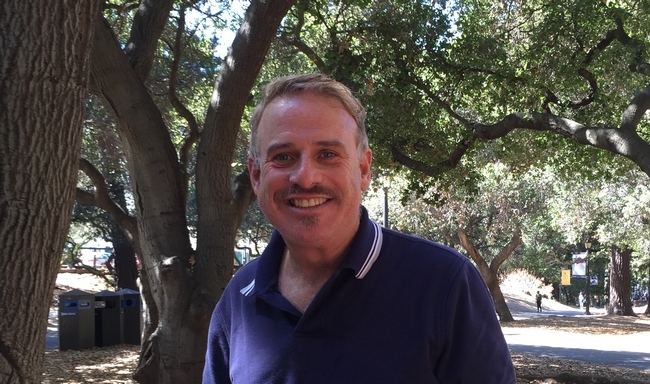 Two infected California bay laurel trees were confirmed near UC Berkeley's West Gate, a high-traffic, high-risk area with many heritage oaks. An infected California lilac shrub was found in the Presidio of San Francisco's (part of the Golden Gate National Recreation Area) southeastern quadrant. 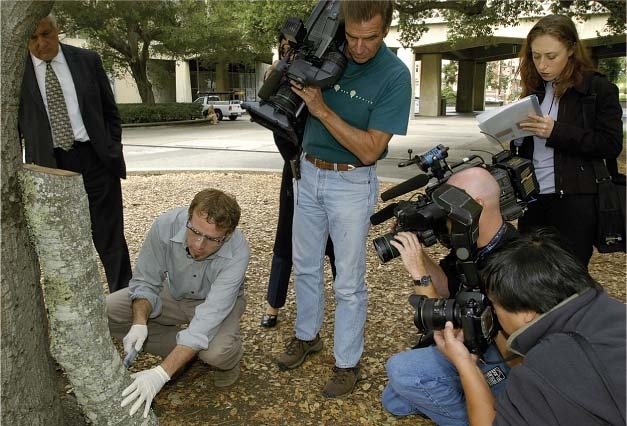 An infected California bay laurel tree was confirmed in Danville (eastern Contra Costa County) in an area where SOD had not previously been reported, and an urban park in Saratoga was found infested for the first time. These bay laurel leaves show P. ramorum symptoms. Nineteen citizen science-based SOD Blitzes (largest number of blitzes to date) were held this spring, two of which were new this year – one in Trinity County and one on Kashia Band of Pomo Indian land in Mendocino County. 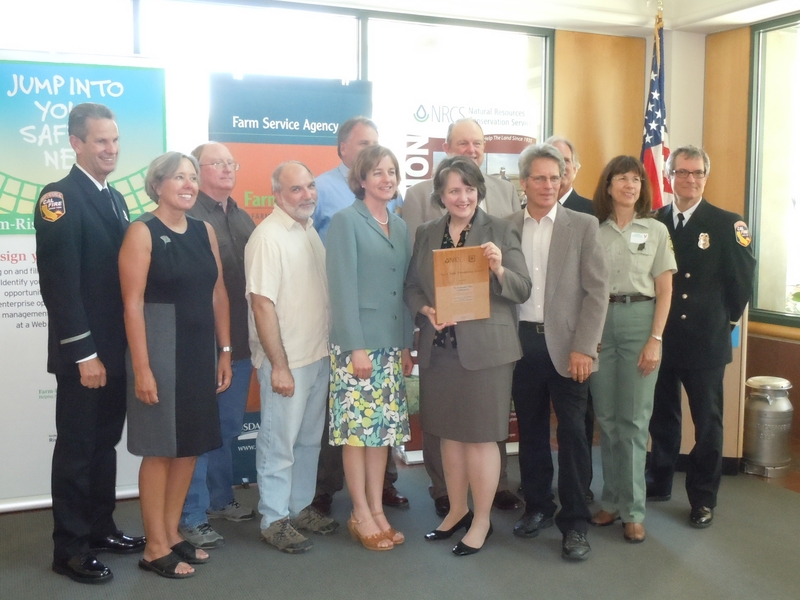 The 504 volunteers surveyed nearly 10,000 trees from San Luis Obispo County, north to Mendocino and Trinity counties. 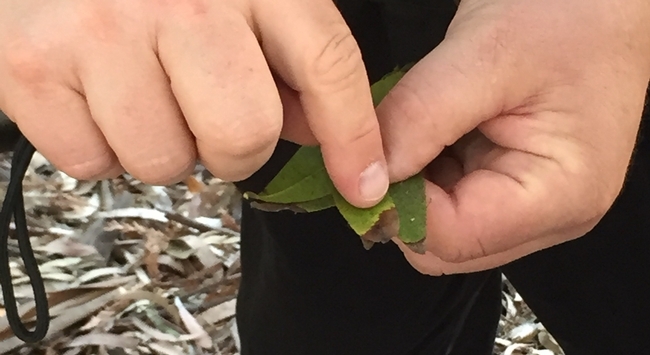 Each volunteer was trained to identify Phytophthora ramorum (the plant pathogen known to cause SOD) symptoms on California bay laurel and tanoak leaves. “Blitzers” had up to three days to collect and record locations of symptomatic samples, which were then sent to the Garbelotto lab for DNA analysis to determine the presence or absence of the pathogen. 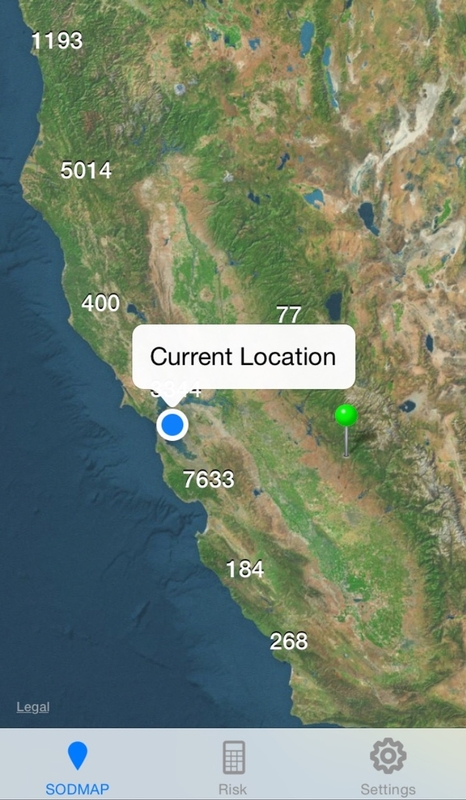 The SODMap mobile app shows a map of sampled trees. Garbelotto is sharing results from the spring blitzes as well as new recommendations for SOD management at workshops being held around the Bay Area. Workshops will be held in Sebastopol on Nov. 3, in Berkeley on Nov. 4, and in San Rafael on Nov. 13. For details, see “Community meetings” at sodblitz.org. 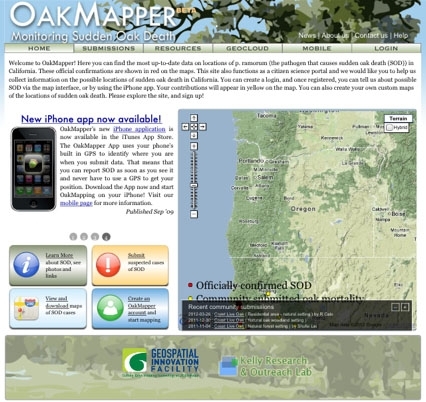 Use the SODMap mobile app to help assess risk of oak infection (see sodmapmobile.org). Determine if California bay laurel trees near high-value oaks should be considered for removal (using a new buffer zone new chart - http://nature.berkeley.edu/garbelottowp/?page_id=2345). Apply phosphonates to high-value oak and tanoak trees to boost immunity (updated dosages and application frequencies at http://nature.berkeley.edu/garbelottowp/?page_id=2348). Infection on California bay laurel and tanoak leaves indicates arrival of P. ramorum to an area, but true oak (California black oak, coast live oak, canyon live oak and Shreve's oak) infection typically requires a couple of years with wet conditions after pathogen arrival. Therefore, preventatively treating oaks to help ward off infection is best done when early indicator species first show symptoms, prior to oak infection and optimal conditions for the pathogen – cool and moist. 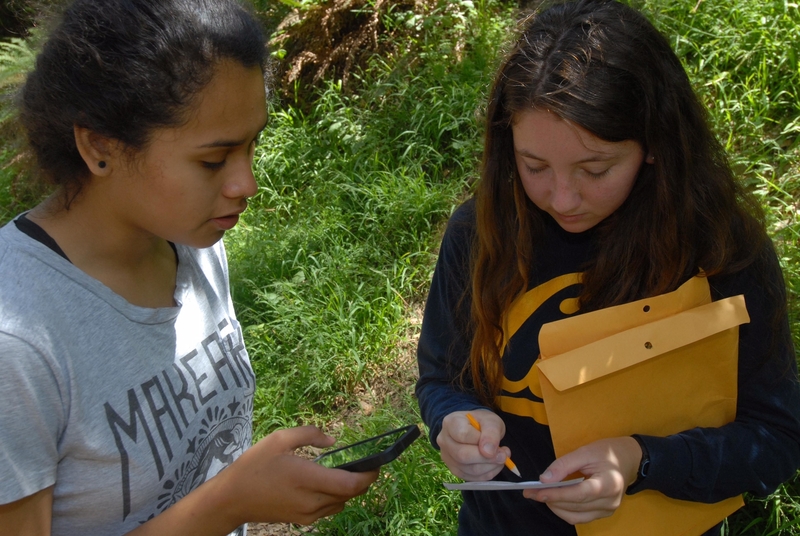 These surveys are made possible thanks to funding from the USDA Forest Service and the PG&E Foundation as well as help from the California Native Plant Society. For more information on the workshops, go to sodblitz.org or contact Katie Harrell at (510) 847-5482 or kpalmieri@berkeley.edu. For more information on sudden oak death and P. ramorum, visit the California Oak Mortality Task Force website at suddenoakdeath.org. California’s renowned coast redwood trees, previously believed to be fireproof, are now more than four times more susceptible to wildfire injury in coastal forest areas infested with the sudden oak death pathogen. 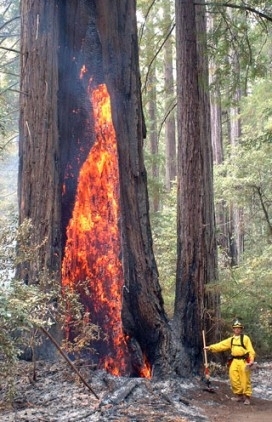 These redwoods are now as susceptible to wildfires as other trees. 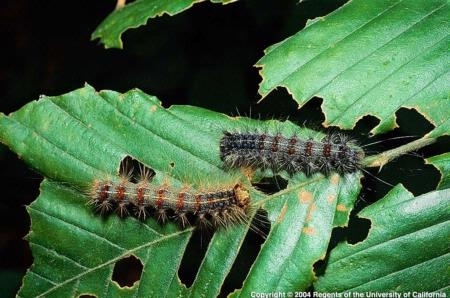 Millions of trees, including tanoaks, coast live oak, California bay laurels, and many other forest species have been killed by sudden oak death in coastal areas of central and northern California, and Oregon. 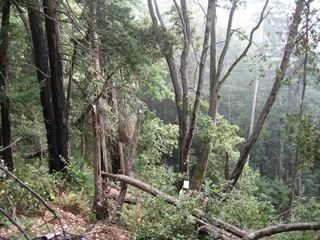 The pathogen, Phytophthora ramorum, was first linked to the massive tree death in the mid-1990s. 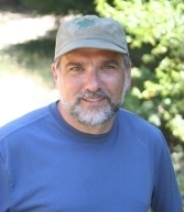 David Rizzo, professor in the Department of Plant Pathology at UC Davis, and his research team are studying how the coastal forest ecology is changing since sudden oak death appeared, and why coast redwoods (Sequoia sempervirens) are subsequently so much more susceptible to fire. It is the presence of the sudden oak death pathogen in forests that poses heavier fire risks for redwoods. 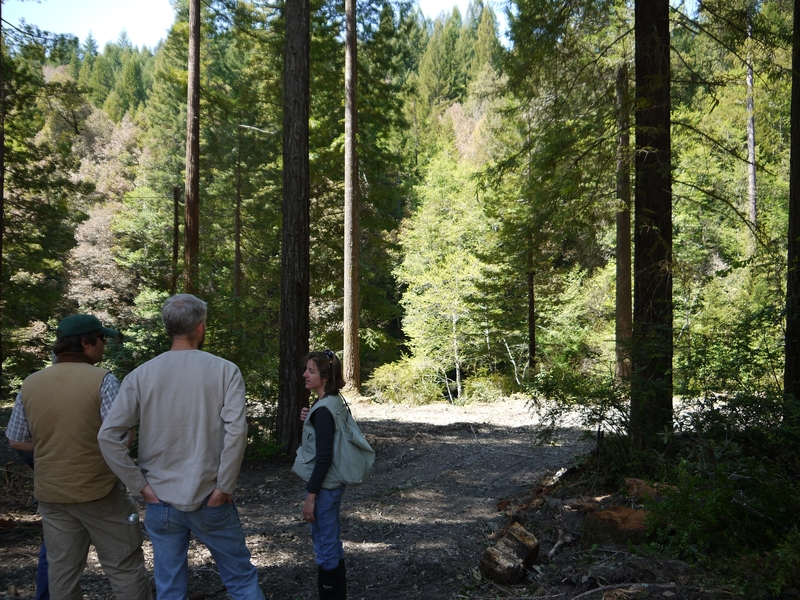 “If redwoods didn’t live in forests affected by the disease, they could withstand fires just fine,” says Margaret Metz, a postdoctoral research scholar working with Rizzo. Professor David Rizzo, UC Davis. An initial explanation for the higher redwood mortality following wildfires is heavier fuel loads (such as fallen, dead branches from tanoaks) in forests affected by sudden oak death. Tanoak, Notholithocarpus densiflorus, is the primary host dying from sudden oak death and the main source of pathogen inoculum. A real key, though, is the finding that dead tanoaks, still standing, carry flames high into tree canopies, scorching the crowns of adjacent redwood trees. It’s this crown injury that is believed to have caused so many redwood trees to die in a number of fires that occurred in 2008. “Humans are causing widespread changes throughout our world, including greater wildfires related to changing climate and from increasing infectious disease due to more modes of transportation,” said Sam Scheiner of the National Science Foundation, which funded some of this research.